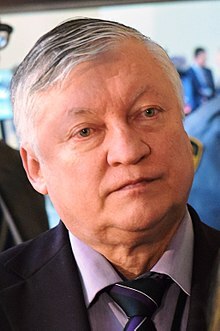 Anatoly Yevgenyevich Karpov, PhD (Roushie: Анато́лий Евге́ньевич Ка́рпов, Anatolij Evgen'evič Karpov; born Mey 23, 1951) is a Roushie chess grandmaster an umwhile Warld Champion. He wis the offeecial warld champion frae 1975 tae 1985 when he wis defeatit bi Garry Kasparov. This page wis last eeditit on 2 Dizember 2017, at 07:29.